We have no idea what “dragon energy” is. We don’t want to know how much Trump would charge for an autographed MAGA hat. We also don’t know how recognizing Trump for the callous charlatan that he clearly is means we’re living in a “mental prison.” Obviously that means we aren’t Kanye West. We'd never want to laugh at or poke fun of people with mental problems. That's just crass. And many hypothesize that Kanye's pro-Trump Twitter rants about being a free thinker are a sign of just such mental instability. If that turns out to be true we'll certainly regret compiling this here gallery of tweets. (And also this here earlier gallery of tweets about Kanye West, which went up on Monday and is mandatory reading before diving into this one.) 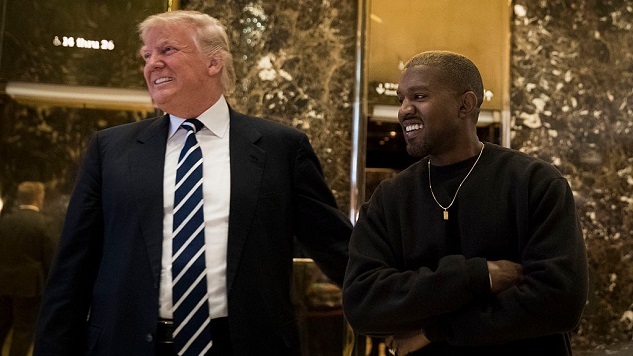 For now though we have no proof that Kanye is suffering from anything other than the same delusion that plagues many Trump supporters, that this president is somehow a brave straight shooter whose supporters are clear-seeing free thinkers. That's been disproven multiple times over, and now it's high time to start reconsidering how we think about Kanye West. Before then, though, let's just get some cheap laffs from the same site that lets Kanye blast his absurdity to the world. Here are the funniest tweets about Kanye West's apparent embrace of Trump and the alt-right, as written by some of the sharpest comedians today. “Let's get lost tonight, we'll deny the holocaust tonight” ~ Possible Kanye Stronger remix lyrics? I saw an angry white guy refer to Kanye as an 'enigma.' I got nervous for a second there. Boy, Tim Allen must be devastated that Kanye West has usurped his role as "coolest conservative celebrity". In fairness to Kanye, "We are both dragon energy, I love everyone, ect." is by far the most coherent pro-Trump take ever produced. Find more tweets about Kanye here.